It's The Cat's Pajamas Release Day! Well, today is the day. The Cat's Pajamas has just released their two new sets--Happy Camper and Nightie (the first alphabet set)! Today I have my favorite project that I mentioned earlier in the week that I could not wait to show ya'll! Sorry to gush, but I just love love love this project! It started out as an idea for little postcard notes that a "happy" camper could send back home, but as ya'll know, sometimes a project takes on a life of its own. 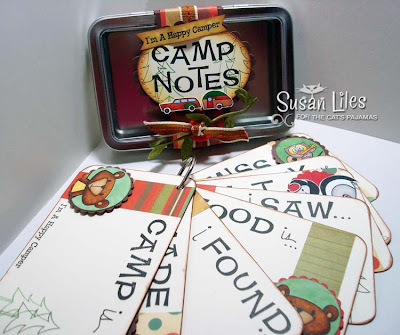 So it became a little journaling album that you'd send a little "happy" camper off to camp with in hopes of it being completed and brought home as a keepsake. The back of each card (not pictured--so mad I forgot!) is reinforced with more of Cosmo Cricket's Mr. Campy papers and could totally accomodate a picture to go with the facing card. It makes me happy just looking at it! Don't you love the Nightie Alphabet set? I only used it for the main words, and handwrote the others on each card for variety (and so it'd fit on some of the cards and they all had to match). 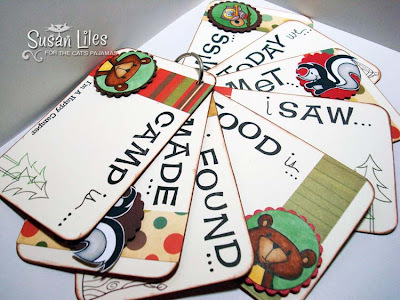 However, the letters are just the right size for this kind of project or scrapbooking which I used it for HERE. I put all the cards together on a binder ring to make it more of a little book and it fits perfectly inside the tin. I didn't do anything to the tin itself. I liked it plain for this theme. I did make the band that goes all the way around it in the middle and it just slides right off to open the tin. The ribbon, vine ribbon and button are all from The Cat's Pajamas as well. Yes, Alma is now going to sell her exclusive ribbon and button collections on her site. These two are from the new "Great Outdoors" collection which are fabulous! Anyway, I hope you get a kick out of this fun project and check out the new stamp sets for yourself. While you're at it, check out some of the other Design Team members and see what they've done with these sets for your viewing pleasure. You can also go to the TCP Gallery HERE. Drooling is totally acceptable. SUSIE Q-TIP: When doing an intensive project like this, keep it on the simple side (to whatever degree you see as "simple"). 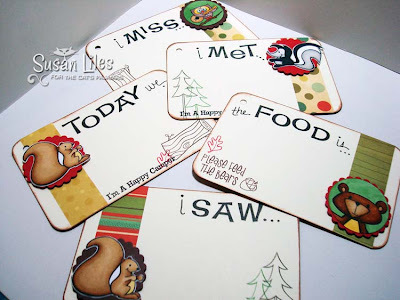 Use repeating themes and layouts to save time. Awesome project Susan! Get's my creative juices flowing. Thanks for sharing! What a fun set for kids to use on their vacation - great way for them to do some creative writing! these images are so fun! this is amazing!! You are so talented, I love your creativity, can't wait to see what you come up with next!! So Cute! Makes me want to find a camp to send my kids to just so I can make something similiar LOL! I am so impressed with your creativity!!!! You're awesome. This is so darn cute and a great idea. I love all the little animals and your coloring is great. Super!!!! This is adorable!!! What a great, great idea and you have every right to gush. DUDE!! Wow, this is so completely stellar. I want to go to camp now so I can use one of these. OMY what a cute set! I'm going to have to go and look at this one! Great job! My dd works at a facility that has summer camps all summer long - this would be so much fun to make for the kids that are there! Ha! Susie, I'm back! I ordered the new sets - can't wait to get them! Thanks for posting the great photo's! Holy cow, girl!!! This is AMAZING! Great idea! Love those images and that fantastic alpha set! THUD. That was my jaw hitting my desk. This is the coolest thing I've seen made with this set YET! LOVE IT! Thanks for sharing it! WOWSA! This is truly amazing. I just love everything about it! Totally darling idea! They grow up too stinkin' fast and this is a wonderful way to preserve some memories :). THUD!!! 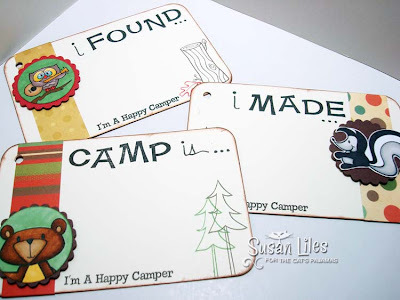 You are a total stamping GENIUS! Amazing project! I LOVE THIS!!! My husband runs a camp every summer and this is absolutly perfect.... I may have to CASE-wtih a twist-this!!! This is such an awesome project! I love it!!! This is awesome...I am so NOT a camper that I wouldn't even know where to begin on something like this but your coloring is terrific...just love this little project! I may have to COMPLETELY case this set. 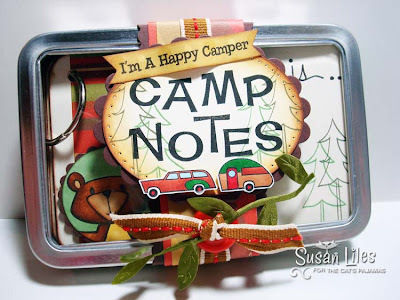 We have a camper in the family this year and this would be a great gift to sneak in her bag! Thanks SO much for sharing this.